I finished today! I built the last two houses and decorated a few yesterday, and finished decorating the last two today! It took three weekends to do it, and a few weekday evenings too, but I finished my 12 putz houses which I intend to turn into 2 Christmas gifts this year complete with boxes to store all of the houses in. Some are whimsical. Some are more traditional looking. 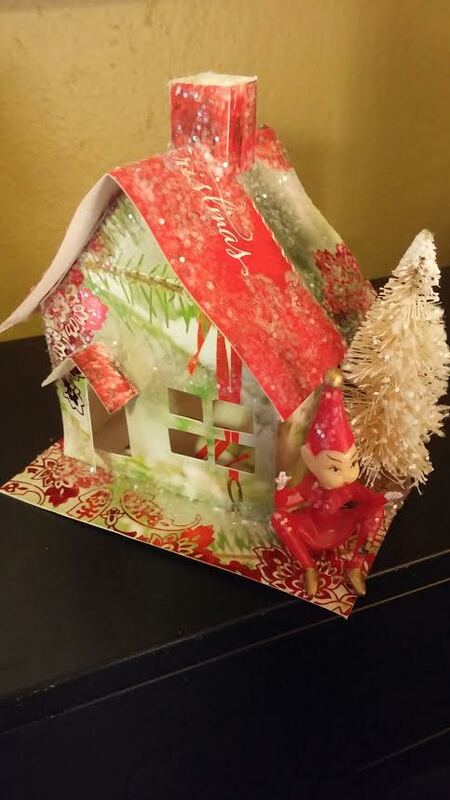 But all of them are made from holiday greeting cards, complete with little miniature trees and decorations. I won’t spend a lot of time in this post talking about the process. Instead, I’ll show you each house I made! This first one is a new template that I just found last week. I love it because of the shape and this particular “real” photo greeting card was perfect. The small white trees and smoke coming out of the chimney made it come to life. I almost wanted to keep it for myself! Here’s the red foil house I showed you in my previous post. I didn’t add anything else to it. 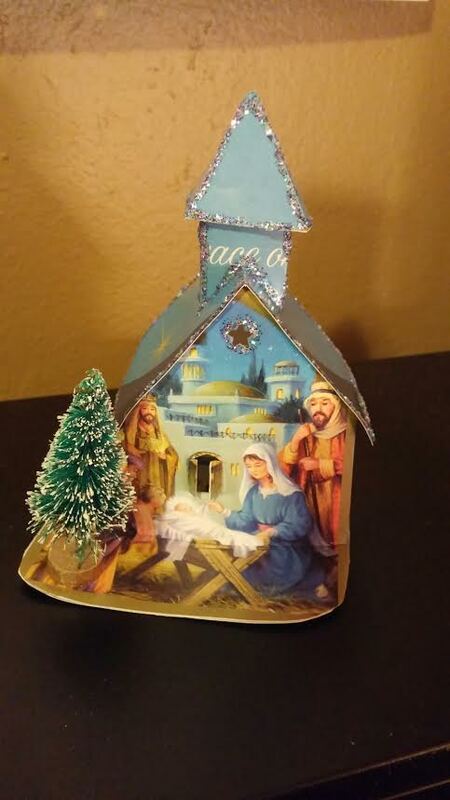 The card alone really made a nice house. 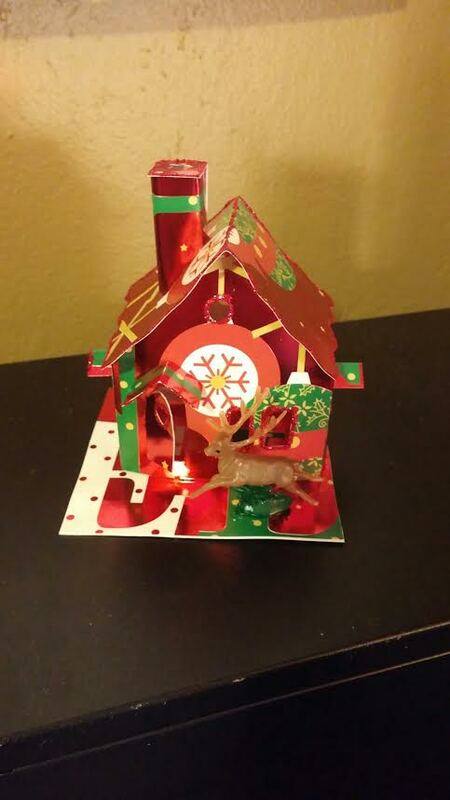 The scalloped roof and red glitter gave it a gingerbread house look, and the little reindeer is fun. 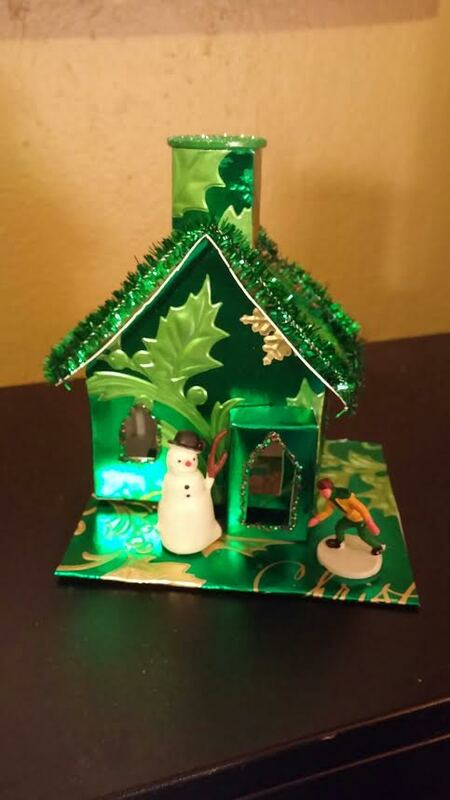 Here’s the green foil pipe cleaner house from my last post. You can see I added a snowman and a skater for a touch of character. It’s probably one of my personal least favorites of the twelve, but it still looks nice. Sometimes less is more and this is the house where I experimented with other elements like the pipe cleaner and button, and I made the front porch piece from scratch. This one was tough to make and I almost considered scrapping it! The pattern is actually for a Halloween-themed train depot. I didn’t do the back platform porch that was part of the original pattern and I added the bell tower. Since this was my first time doing this pattern, I should have tested it first before I started cutting up cards! Another lesson learned! That’s also why it lacks quite a few windows. I got busy gluing and forgot to cut them out! But I knew once I added the glitter and the tiny nativity that the look would improve. I think it turned out nice overall. 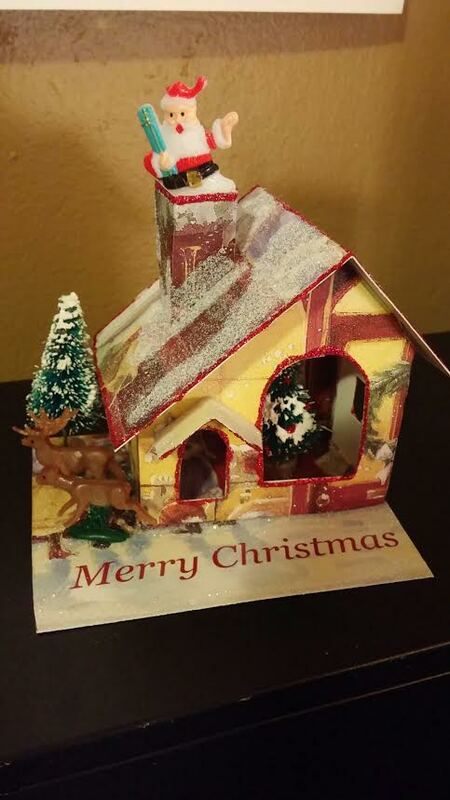 The person I am giving this one to collect nativities so it will be a very special part of her putz house village. This one is another new pattern for me this year, and I liked it so much that I made two of them – one for each village. The house has a large picture window on the front in which you are supposed to put a small scene inside the house or you could cut out a small picture and tape it inside the window. If you cut the holes in the back of the houses to add a light, this one really has a lot of appeal. I decided to do a Christmas tree inside. The reindeer outside and Santa coming out of the roof made it even better. 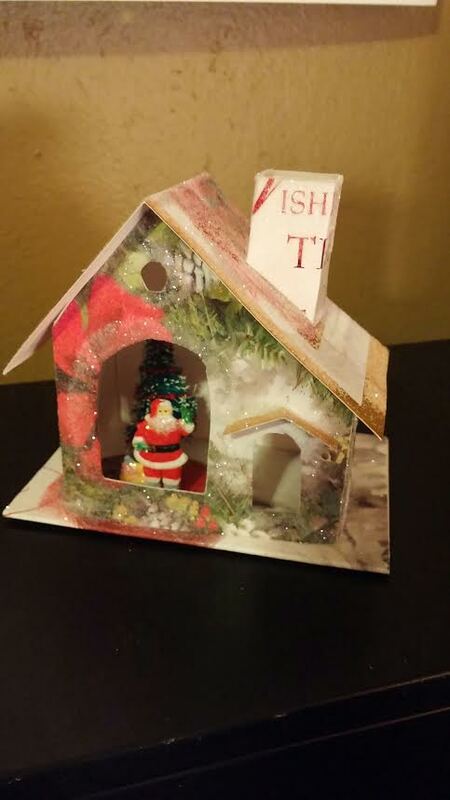 Notice the “Merry Christmas” on the base – another fun reason to use greeting cards to make these. I try to cut around the words so they can be seen on the base or the roof. The glitter on the base is actually from the card itself. 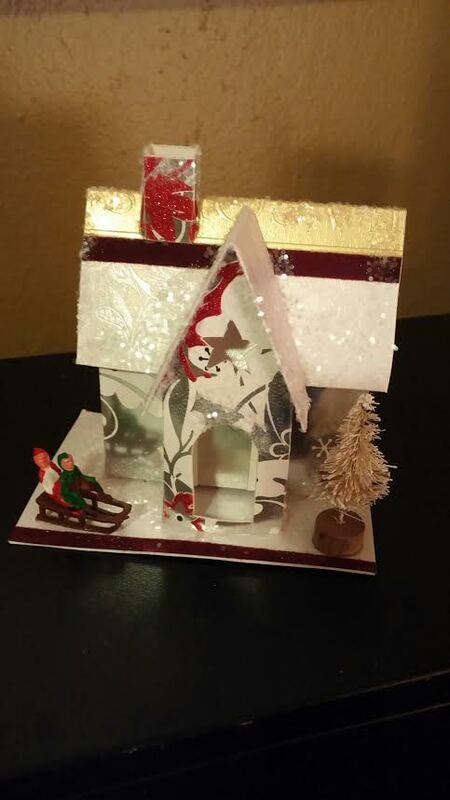 I added more glitter to the roof, and outlined the house in red glitter glue. Here’s the other picture window house with Santa on the inside in front of the tree. And notice I just flipped the pattern of the house so that the two houses would not look completely the same. This one is one of my favorites also. 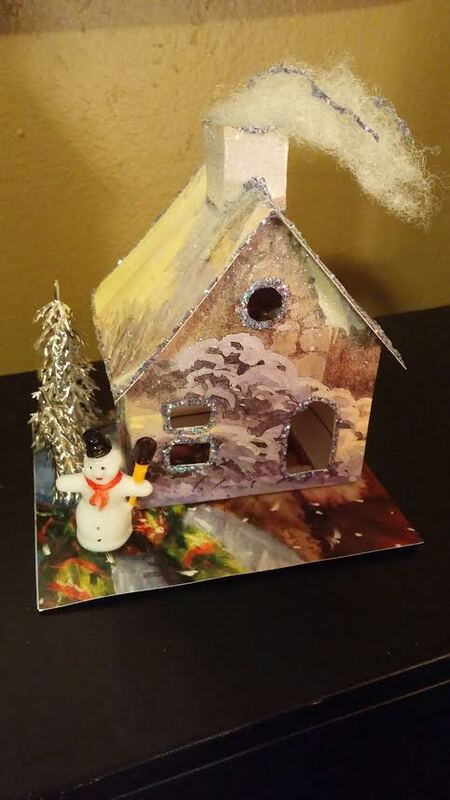 I put two silver trees and a snowman on the outside and smoke coming out of the roof. 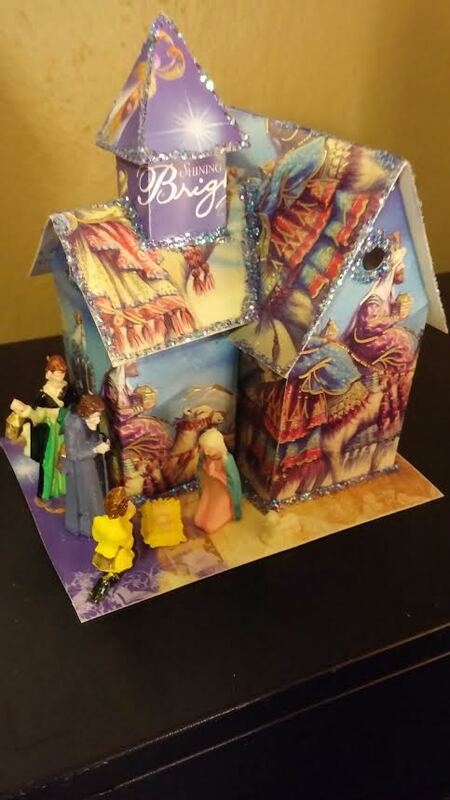 I outlined it in blue glitter glue and then flocked the roof and base with glitter. 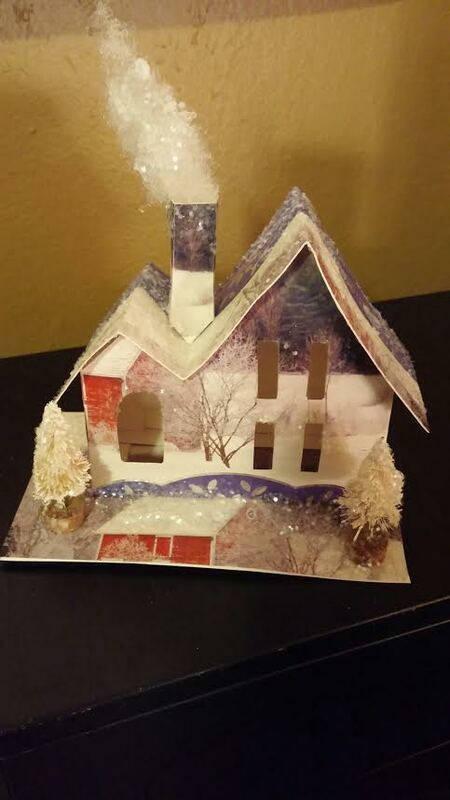 Very simple, plus the design on the card helped give it a cozy winter feel. Here is the “Little Charmer” from my previous post. I added the tree to it since then. This was a tough house to make last year, and the only one I did that was in two pieces last year. Having done it before, I tweaked the pattern a bit and moved the front piece to the center for a different look. It turned out nice. Another one of those where the pattern on the card really adds to the look. This one reminds me of a little red school house. 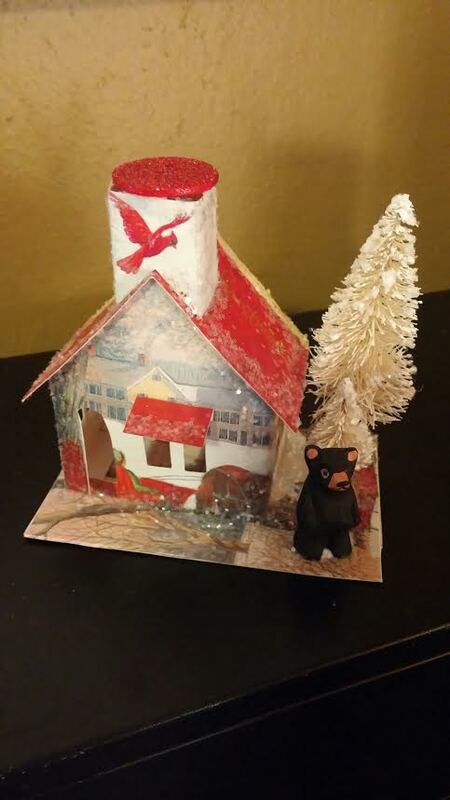 It’s another one of those where the pattern on the card really makes it, right down to the cardinal on the chimney. I used a red button on the roof. And that’s the little bear I found at Hobby Lobby. Notice the awning above the windows – I got the idea for it from those Hobby Lobby pre-made houses I showed in my last post. I call this one the Pixie House. It’s the same pattern as the earlier house with the silver trees. Another one where the card pattern really adds to it. Thankfully I had 3 cards that were all the same because this is a tough house to make from just one card. The little pixie elf came from Etsy. 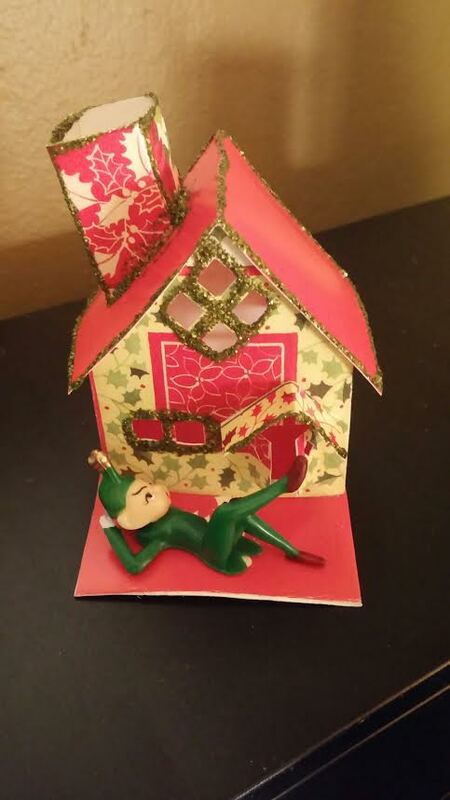 And my last of the 12 is another little pixie house with a green pixie lounging out front. Very simple. I thought the design on the card made it look like a gingerbread house so I kept the detailing to a minimum on this one. And that’s it. I’m going to share a few more pics of all the houses together in one of my pic of the day posts tomorrow. But as I’m writing the end of this blog post, I’ve already packed the little houses away in their gift boxes and they are ready to go under the tree! Thanks, Melinda! I’m really proud of them this year. I keep getting better and better. And making them really puts me in the spirit.